To get things started, I thought it best to lay out the design to better get a feel for the pieces and steps. That also made it easy to get the sizes of the maple veneer just right, and that made the work go much quicker. After I had the design, I snapped off pieces of the ebony stringing and cut the small pieces of maple from a leftover sheet of shop-made veneer – I’m tired of sanding through the 1/40″- or 1/64″-thick commercial veneer and vow to never purchase it again. To make sure things went as planned, I stuck the pieces to a piece of tape, then checked the size against the actual keystone. I was now ready to stick the pieces to the keystone. With a thin layer of glue on the keystone, I positioned the veneer and stringing. (Again, I really like the Titebond No-Run, No-Drip Wood Glue.) A neat technique was to lock one leg of my spring clamp into my bench vise, leaving the other leg operable. This allowed me to easily move or reposition the keystone in any way necessary. 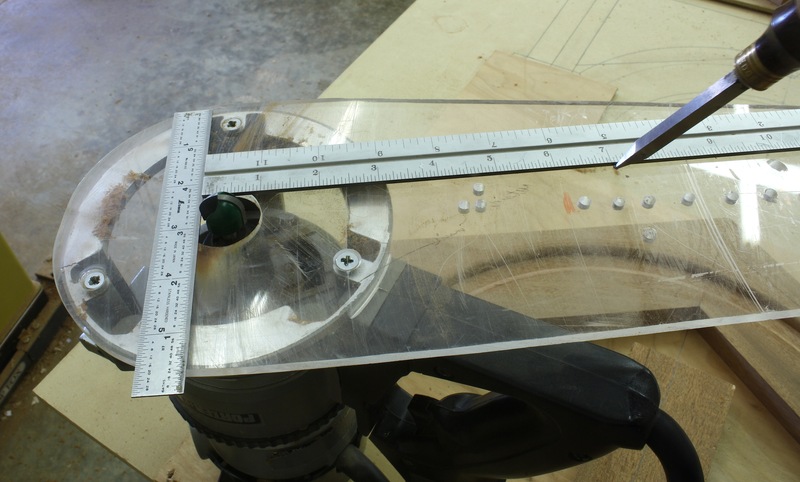 At this time, I wasn’t concerned about the length of the pieces applied to the workpiece. I didn’t want them to run past the top and bottom, but I also didn’t need them to be perfectly aligned. After everything was placed and slide to its final position (moving the veneer pieces up or down influenced the overall width of the assembly so I could easily match the keystone face), I set the piece aside to allow the glue to dry. 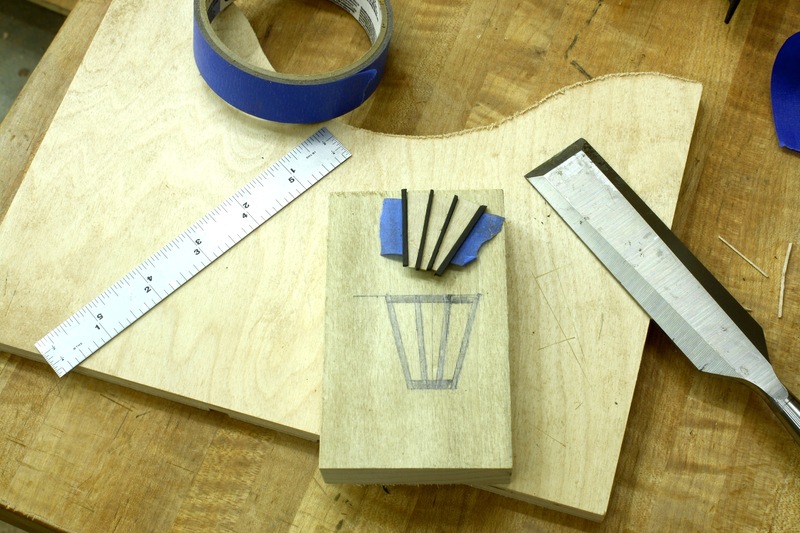 The next step after the glue dried – about 10 minutes – was to saw the top and bottom edges to add the last pieces of ebony stringing. A marking gauge is perfect to scribe lines to which to saw, and I particularly like a Japanese saw for these types of cuts. With the assembly locked in the spring-clamp vise, I sawed the two lines then peeled the waste parts easily off the keystone. A little more glue was added before I position the two last parts to the face of the workpiece. After the glue dried I used a rasp to level and smooth the inlay, then sanded everything smooth with #180-grit Abranet. The finished keystone is shown in the opening photo. 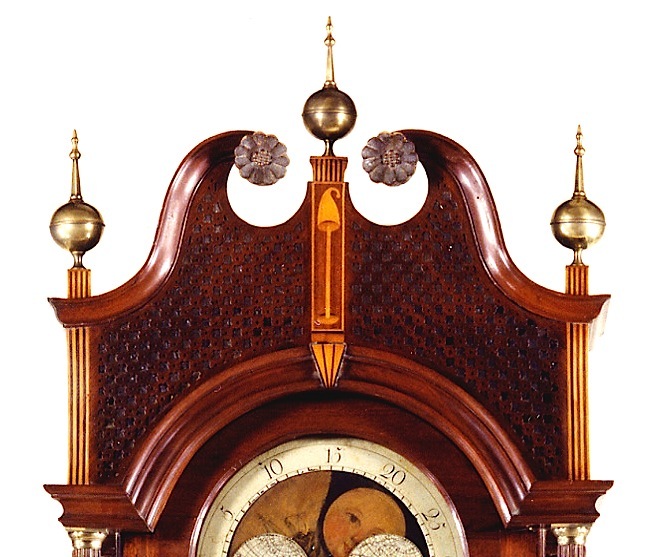 It’s a small piece that adds significantly to the overall look of the clock. And that’s what inlay does, at least to my eye. Also, if you look at the opening photo you can see the first carved rosette that fits at the end of the goose-neck moulding. I ran through three alliterations before arriving at what I think will work. To get a quick look, I stuck the half-finished rosette in place, then stood back to make a decision. So far, so good. But there is more work to be done. I promised last week to show you the moulding installation. But if you stopped by, you found that I was unable to post. So as promised, here is the technique I use to cut, fit and install the lower moulding on the tall clock. Layout is the important step. First position the arched moulding to the hood. After it’s in position draw a line along the back or top edge. 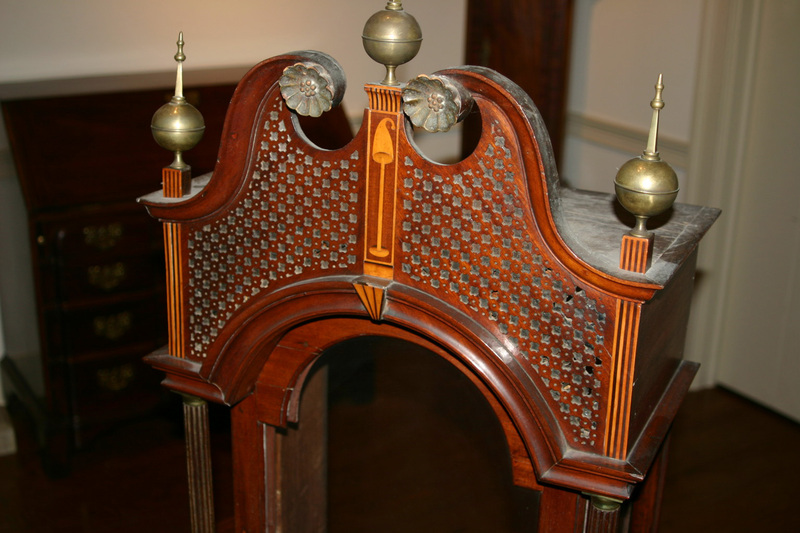 Make the line run the entire length of the moulding, or at least indicate where it crosses the inlay at the center and the lower 2″ at the hood’s base. 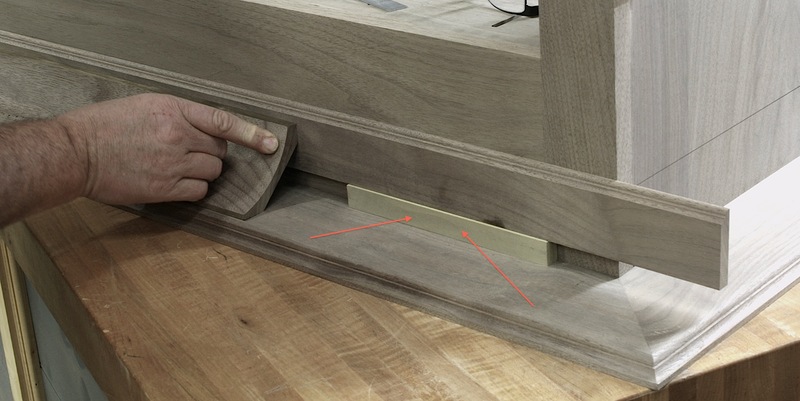 The second step is to lay in the straight line to indicate where the moulding runs along the base – show the area that fits between the arched moulding and the hood’s return. To obtain the angle needed to fit the two pieces (arched and short straight) draw a line from the two corners as shown in the photo above. To reveal the cut lines on the moulding, slide the arched piece back into position then use a couple of spring clamps to keep it in place. 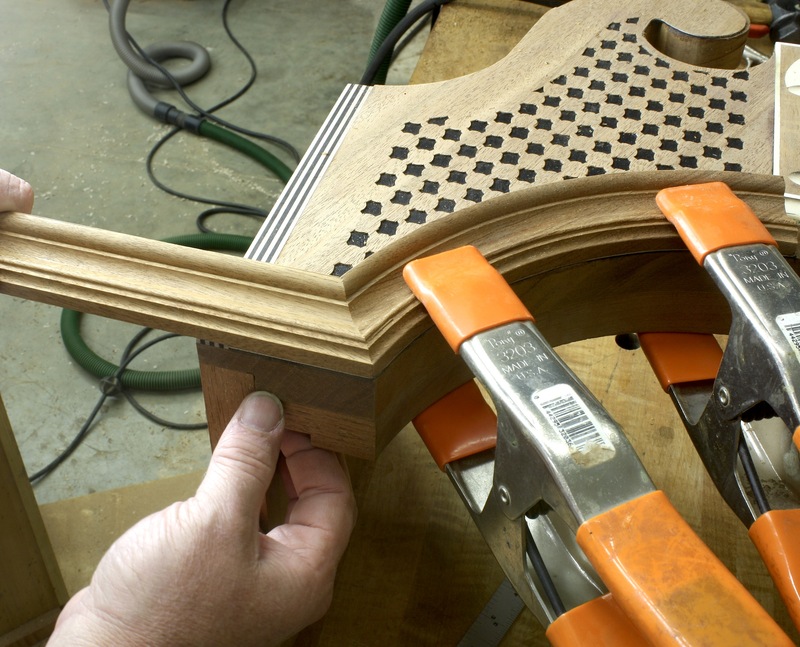 On the top edge of the moulding, mark where the lines intersect – the intersection of the arched and straight, as well as where the arched crosses the inlay should be marked. 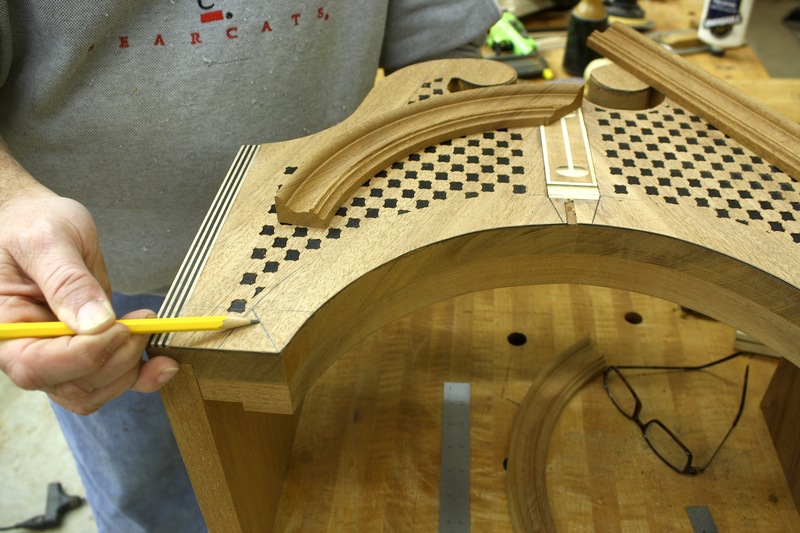 Repeat the steps to mark the two points on the inside edges of the arched moulding. Both steps are shown above. On the back face of the moulding, make a couple of tick marks that show the two points then use a rule or straightedge to draw the line from mark to mark. Strike the lines at the two layout points. I also square the lines down the back edge of the mouldings to provide two points of reference as I cut. 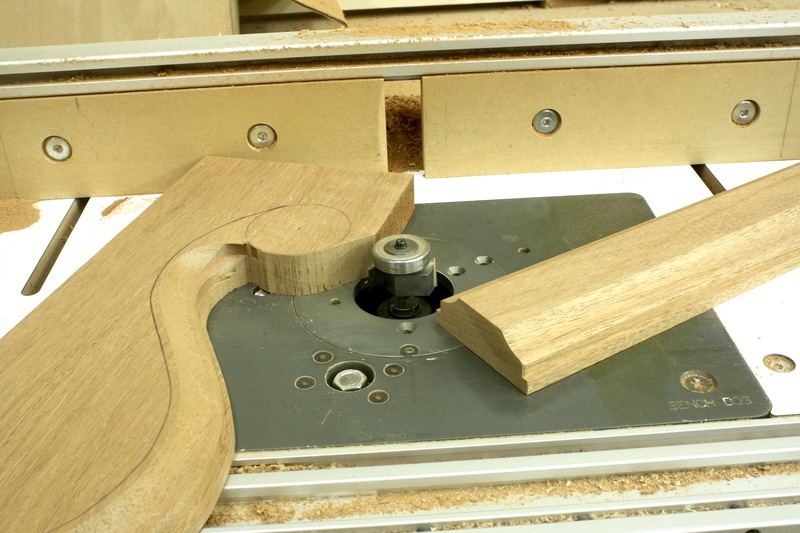 Because the moulding is arched, a couple of spring clamps will hold the piece secure as you cut. The easiest way to cut the lines is to grab your handsaw and make the cuts. 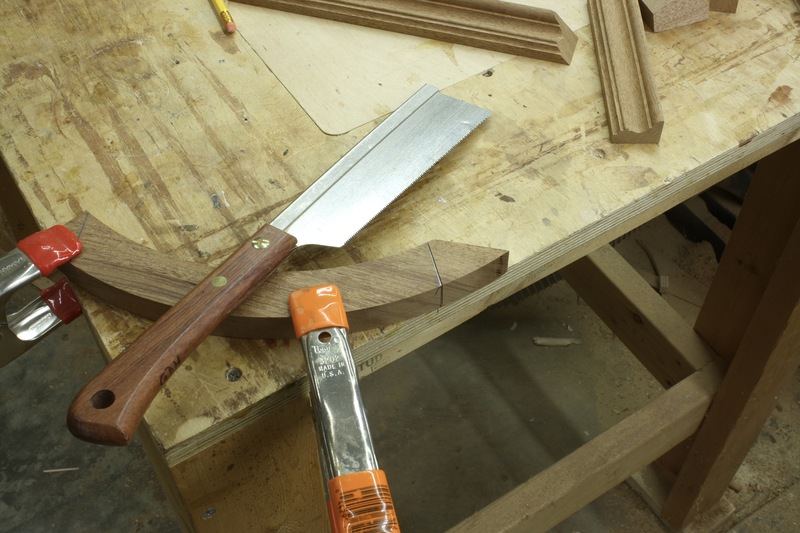 I like a Japanese saw for these cuts because the finer teeth are easier to start, and glide through the cut better. This saw is from Lee Valley (link). 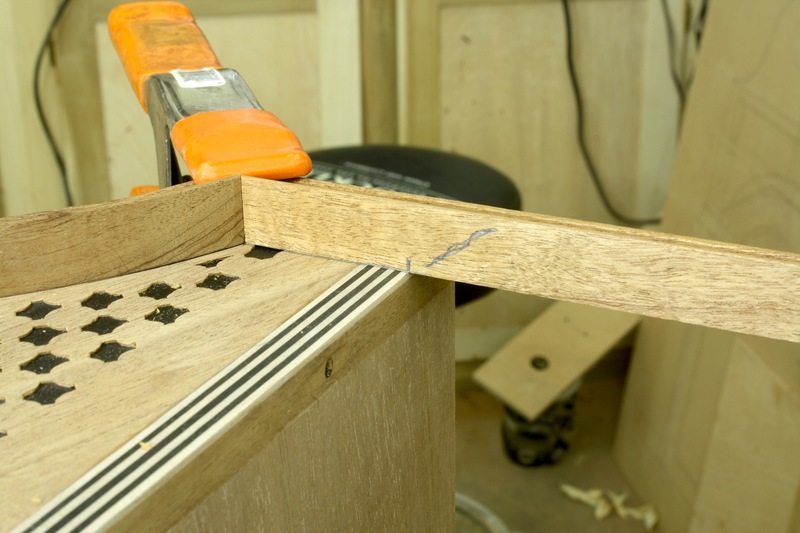 Make the cuts while watching both lines – it’s the same as when cutting dovetails. 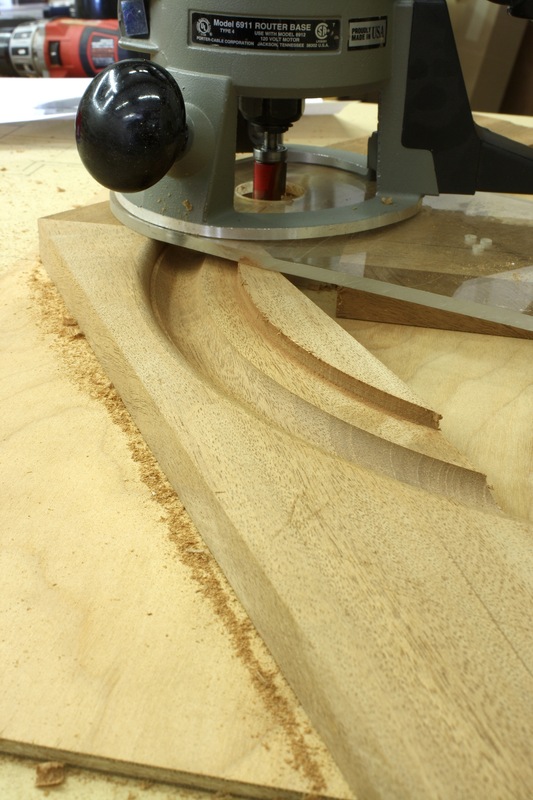 After the arched moulding is cut (touch-up the cut with a small plane if you’re off your layout line), reposition the arched moulding to the hood. The next step is to cut and fit the short, straight moulding at the base. You can repeat the same procedure to cut this piece; layout the two points, strike your line then saw the cut by hand. But for this cut – because it is a straight piece of stock – I work at my miter saw. I simply guess the angle then make a couple of cuts to hone-in on the final angle. 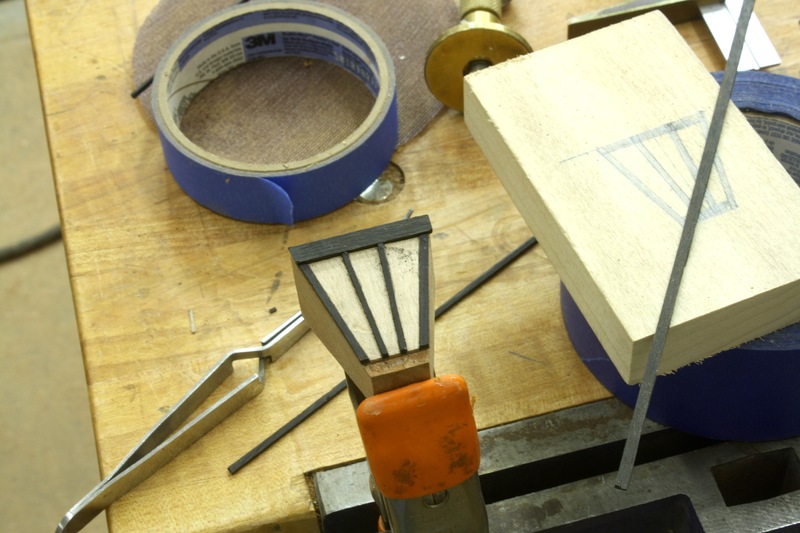 You could, of course, use a bevel gauge to setup the correct miter. 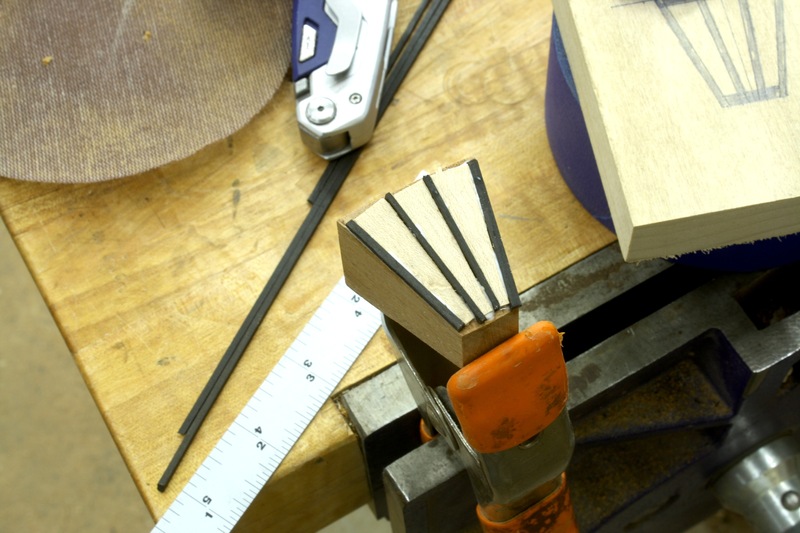 Even using a bevel gauge, I find myself fine-tuning the cut, so I go right to the saw. Make sure your fit is tight and that the moulding profiles align. You will have a small amount of work to do to bring the two profiles to match, but the work should be minimal. For me the tricky part of this installation is the next step. On the top edge of the straight moulding, mark the start of the 45° bevel, and indicate the direction of the bevel. (That’s where I sometimes have problems.) It’s easy to get things turned around as you move to make the cut. I, again, use my miter saw. 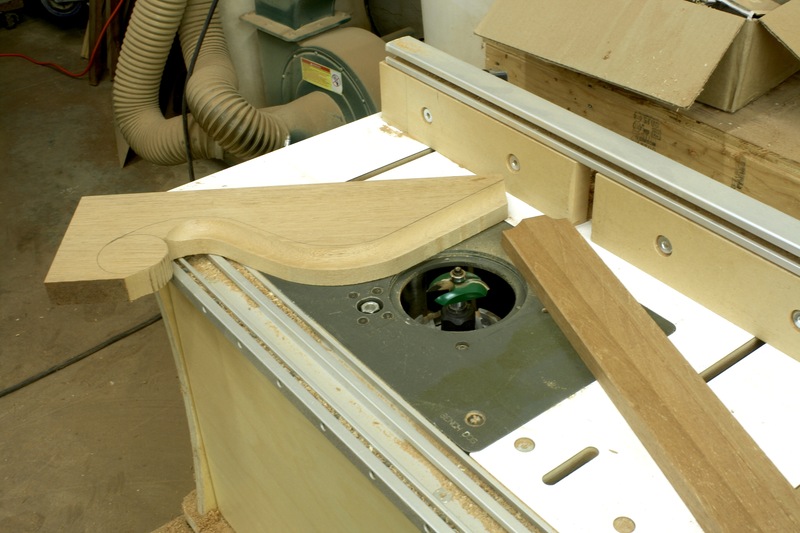 This is also a straight piece of stock and easily set and cut at the miter saw. Because it is a small piece, you may not feel comfortable at a power saw. If that’s the case, use your handsaw and a bench hook to do the job. The last piece – on this first side – is the return. It’s a simple 45° cut at the front with a 90° cut at the rear. 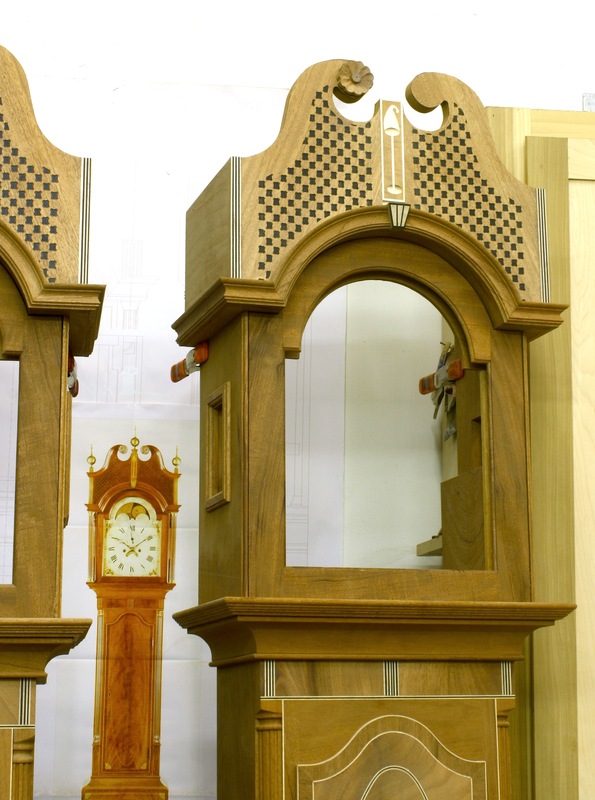 With all the parts cut and fit, turn your attention to the second run of mouldings. The process is the identical, but the angles are reversed. When both sides of the mouldings are fit, use spring clamps to hold a run in position as you prepare to attach the pieces to the hood. 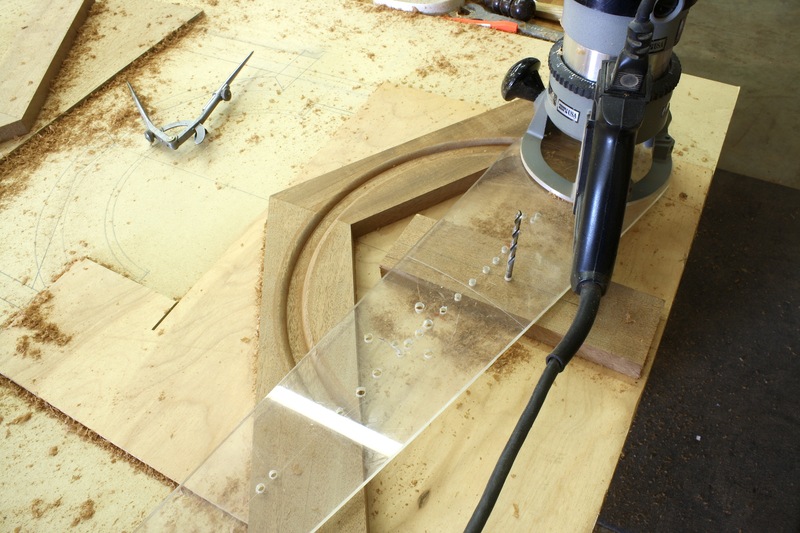 Working with the arched piece of moulding, add a thin bead of glue to the back face, then position it to the hood and to the short straight piece that is clamped in place. A few #23-gauge pins hold everything as t he glue sets. Work from there to the return, then repeat the same steps to install the second run of mouldings. 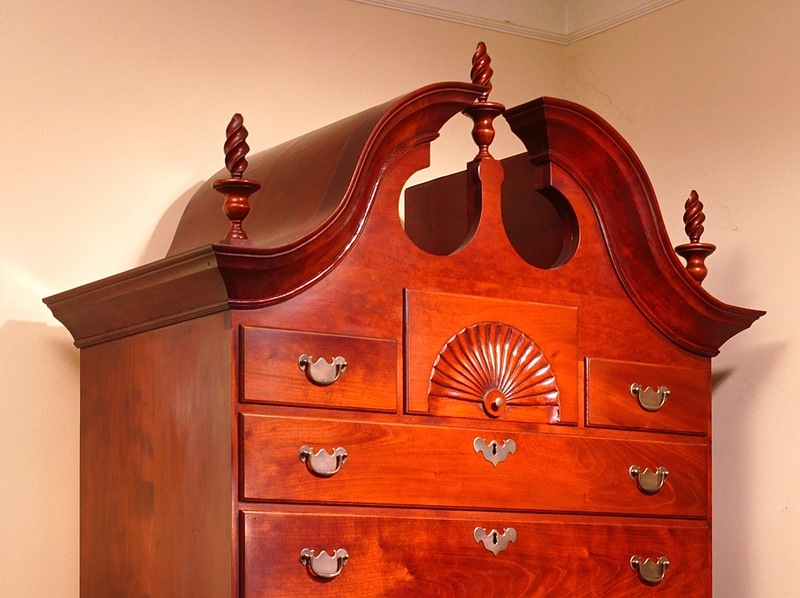 Any piece of furniture looks best with proper mouldings – be it waist mouldings, base mouldings or the most important crown mouldings. Crown mouldings can be as simple as a flat-cut, angled design as on my adapted Shaker Press Cupboard from “Fine Furniture for a Lifetime” (Popular Woodworking Books), or a complex assembly such as found on the Canadian Step-back Cupboard in the same book (shown on the right). Installation of these mouldings can sometimes be laborious and/or tricky. With this post, I thought I would share a few tips to make sure your moulding work is easy. 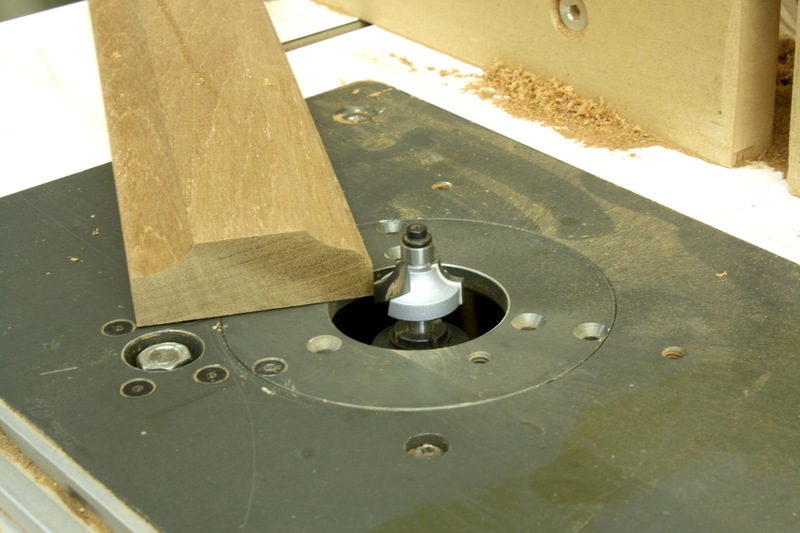 First, take a look at the poplar spacer in the photo below. In working on a three-stage crown moulding, I need my thin, lower moulding to extend beyond the cove just the right amount, at least to my eye. With two pieces of scrap cut to 1-1/8″ in width (an estimated width), I can balance the first moulding in place then fit the cove to the case. Not happy with the look, I shaved an 1/8″ off each piece and took another look. Those spacers keep me from having to mark up my case with lines that need to be sanded away. I made three changes before deciding on the location. I ended up with a 3/4″ spacer. Spacers also hold pieces in position as you work to wrap the mouldings around the case. It's always a good thing to wrap mouldings around your case. Here the end piece was a cut-off from the front. By wrapping it around the corner, you have a nice match in grain and finish. The front piece of cove is next to fit. 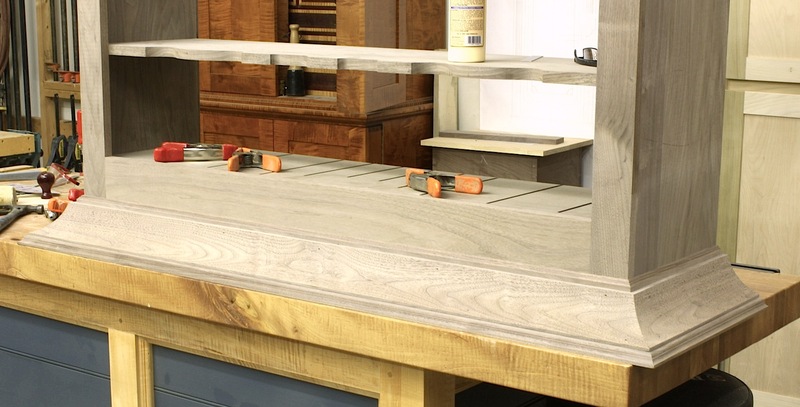 Make your saw cut with the cove right-side up, or so the bottom edge is down to your miter saw table and fence. It takes a bit of balance to make this cut. If you lean the moulding out or back, you influence the cut – that is something you can use to your benefit to tweak your fit as you gain experience. 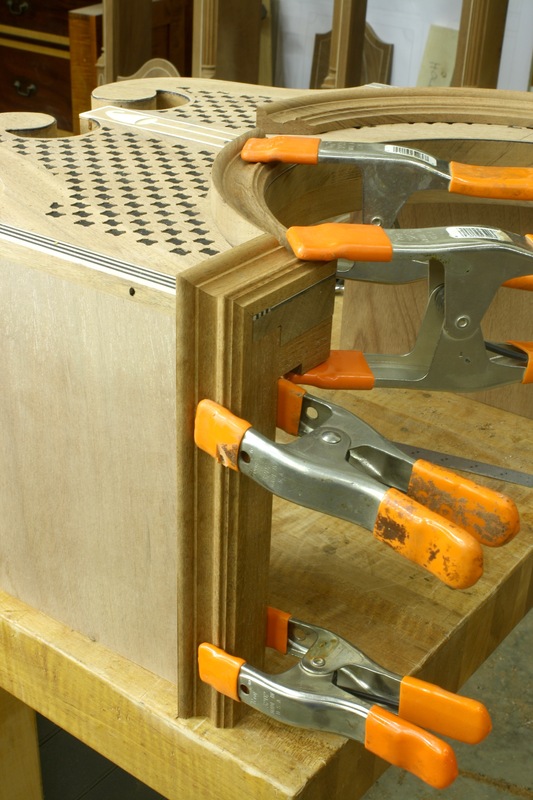 Position the front cove to your case by matching the angle-cut ends, add spring clamps to hold everything in place then mark and cut the second end of your front cove. Finally, fit the remaining end and trim the lengths to size. My last tip for mouldings is to glue end grain as you assemble pieces. 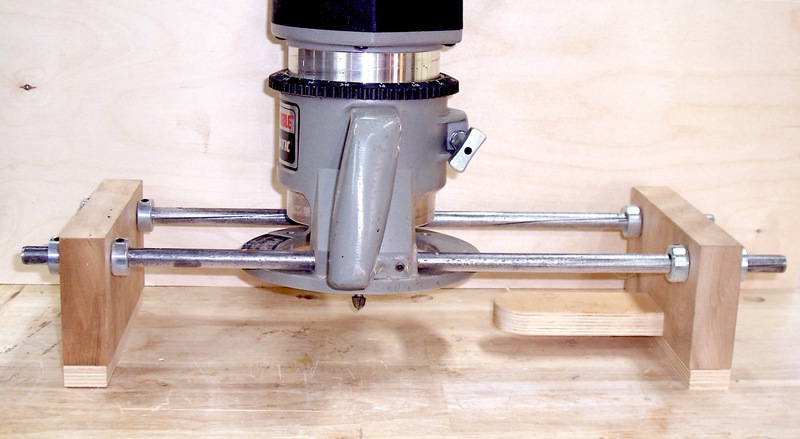 Most woodworkers forget this step, but it really adds strength to your stacked mouldings. Below is what I’m working on with most mouldings in place. There is one more piece to add to the works. It’s a frieze moulding that is centered between the bottom edge of the crown moulding and the edge of the door opening. I’m sure you’ll see the finished piece somewhere down the road. 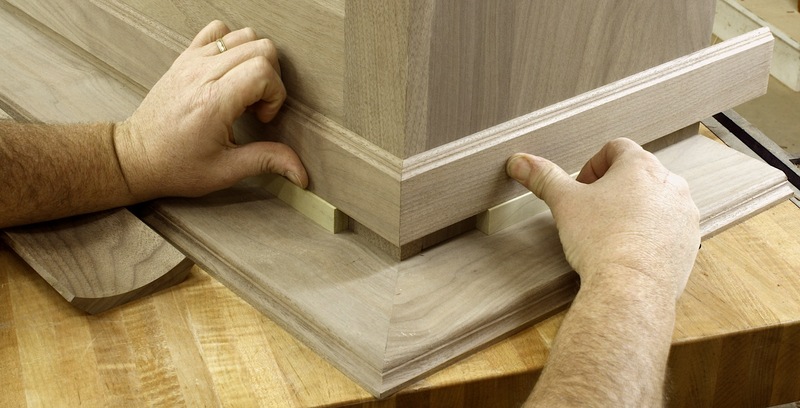 If you have a simple trick to cut or install mouldings, please add it to the comment section below. Any help is appreciated.